The physical edge between a higher education campus and its neighboring community often serves as a place for tradition, celebration, and the joining of town and gown. However, this is not always the case. Edges can also create a wedge between these two entities through issues such as traffic and parking changes, unsightly views, and changes in the socio-economic structure of the campus surrounds. In recent years American colleges and universities have seen rising student enrollments, exacerbating these issues as the campus built environment rapidly changes and even expands. In response to these forces there has been a proliferated call for collaboration between campus and community, particularly related to the built environment design and planning process. One obvious place for campus and municipal designers to join efforts is at the campus-community edge, where changes often significantly influence both sides. However, researchers describe that when town and gown work together, there are often dichotomous collaborative efforts where the university is in control. This is especially the case in American college towns, where the physical, economic, and social structure is by nature heavily influenced by the institution. A recent study out of Clemson University explores how collaborative efforts in the built environment design process might serve to make a more even playing field. This study gathered qualitative and quantitative feedback from both campus and municipal planners, university administrators, local government officials, and other key decision makers who might impact the built environment from two public universities in the Southeastern United States. The study measured the perceived level of collaboration between town and gown and compared this to a spectrum of variables ranging from social to physical considerations. These included levels of social acceptance between the two groups, levels of perceived sense of place at the campus-community edge, and the desirability of this physical environment. 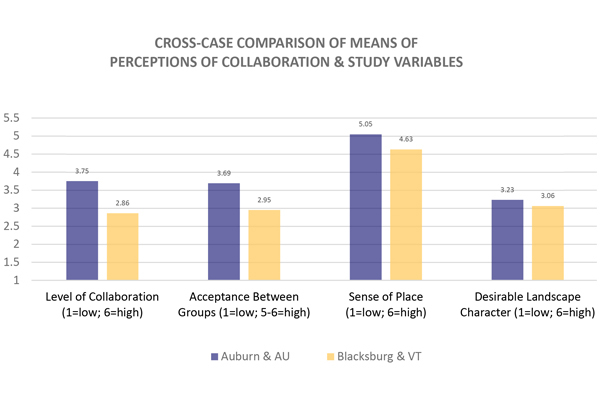 The proposition was that campus-community collaboration has a positive relationship with these variables, with the potential to provide empirical evidence for the importance of reaching across aisles within the college town context. For both case studies there was a strong correlation between higher levels of collaboration and social acceptance between groups, signifying that collaborative efforts and good social relations work hand in hand. 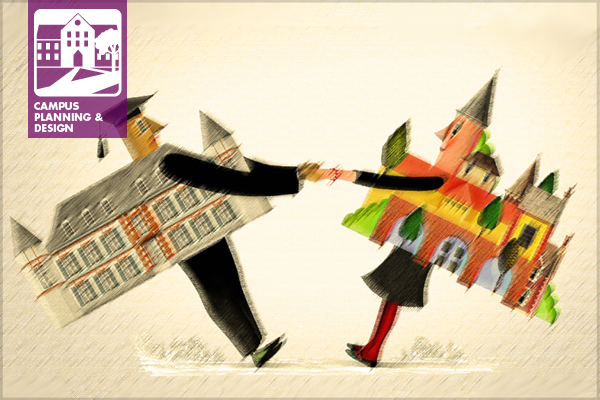 However, university representatives always perceived stronger collaboration and a better town-gown relationship than their municipal counterparts, revealing that even in the best cases the municipality does not feel like an equal partner. Interestingly, having shared goals for the built environment between campus and community showed a more positive influence on the relationship than being involved on design and planning projects together. In the case study with higher identified levels of collaboration, there was also a higher sense of place at the campus-community edge. This implies that when town and gown have a more collaborative relationship, they not only think more highly of one another, but they also have a higher bond to their shared physical environment. Additionally, there was also overall higher levels of desirable landscape character for the case with higher collaboration, meaning that there is a potential association between town-gown collaboration and how physical projects turn out at the campus-community edge. Town and gown are in the same boat, and yet limited resources and the demands of institutional growth can leave municipalities feeling like they’ve fallen overboard. To foster resilience in social and physical environments in American college towns, there must be a transparent and inclusive design and planning process. Projects which affect both town and gown should include one another in meaningful ways on the front end, and continuous goal setting and communication between the two creates a foundation that affects the health of social relations and the desirability of physical space. After all, a great institution needs a great place to call home, and this starts with a mutual respect and interest in both campus and community built environments. Jessica Fernandez, Ph.D, PLA, ASLA, LEED AP ND, is a Lecturer for Clemson University’s Landscape Architecture program. Dr. Fernandez is also Co-Founder of ALPHA Design Studio where she serves as Director of Landscape Architecture and Visualization Art Director. Her practice specializes in higher education landscape architecture and master planning projects as well as urban design. Dr. Fernandez previously worked at RDG Planning and Design in Des Moines, Iowa and Niles Bolton Associates in Atlanta, Georgia. Her research explores the intersection of social and physical constructs in the creation of place. This post came out of the joint Campus Planning & Design and Landscape—Land Use Planning Professional Practice Networks (PPNs) meeting that took place during the 2018 ASLA Annual Meeting and EXPO. Three PPN members presented topics on the theme of resilience during the meeting. Their presentation slides may be viewed on the Campus Planning & Design PPN’s Resources page.